We’re really pleased with the range of color included in the share this week. We’ve included beautiful golden beets, purple top turnips, and the first of our summer carrots. 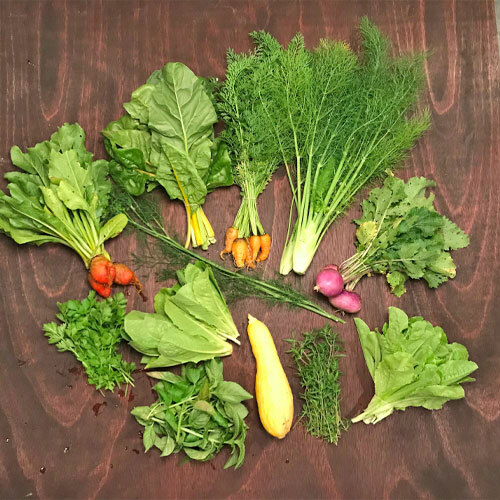 The great part about all of these root crops is that all of the green tops are edible and delicious! 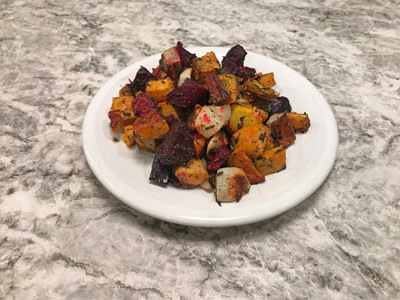 We made a wonderful root vegetable dish that has a lot of flavor with not a lot of ingredients. We also included a few versions of pestos which show the range of delicious flavors leafy greens have to offer. We hope you enjoy the recipes this week! Remove the leafy greens from the turnips, beets, and carrots. Peel the turnips and beets. Chop all root vegetables and one sweet potato into one inch cubes, and put in a large bowl. Dice 1 clove of garlic, all of the summer savory greens, and add it to the bowl along with 3 tbsp of olive oil, salt and pepper. Toss well and spread out on rimmed baking sheet. Roast for 45 min turning half way. To make pesto blend 2 packed cups of fennel fronds with 1/2 olive oil, 3 tbsp slivered almonds, 1 tsp salt, 1/4 tsp pepper, 2 tsp lemon juice, and 2 cloves garlic. Boil 1 cup of dry black beans for about 1 1/2 hours, or until tender. Rinse and drain beans, then add to large mixing bowl. Cook 1 cup of dry pearled barley according to package instructions(or substitute another grain such as quinoa, rice, or couscous). Add barley to black beans. Mix pesto into beans and barley. Add 3 tbsp olive oil to a large skillet over medium high heat, then add 1/2 yellow onion, diced. Saute for several minutes until onion is fragrant, then add 2 summer squash which are halved, then halved again, and chopped into 1/2 inch sections. Stir squash and onions frequently and allow to cook for 6-8 minutes, or until squash are tender. To assemble dish mix- Add barley to black beans. Mix pesto into beans and barley. Add onions and squash and mix ingredients thoroughly. Add additional lemon juice to taste, and feta cheese if desired. Finely chop 1/2 bunch of dill, about 2 tbsp when chopped. Finely chop 1/2 bunch of celery greens, stems and leaves, about 1/4 cup finely chopped. 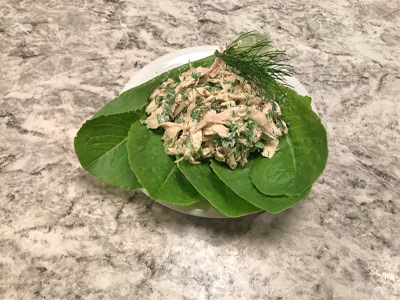 In a large mixing bowl combine 2 cups shredded, cooked chicken breast, 1/2 cup mayonnaise, 1/2 tsp dijon mustard, 1 tsp lemon juice, 2 tbsp dill, 1/4 cup celery greens, 1 tbsp finely chopped onion, 1 tsp salt, and 1/4 tsp pepper. Serve chicken salad on boats of romaine lettuce, or on a bed of chopped salad greens. Cook 2 strips of bacon in a large skillet over medium high heat. Once cooked, about 6-8 minutes, set bacon aside and remove all but 2 tbsp of bacon grease. Add 1/2 diced yellow onion, 1 clove of garlic, and cook until fragrant, about 5 minutes. Add chopped fennel bulbs, 1/2 inch chunks, and Swiss chard stems. Cook until softened, about 3-5 minutes. 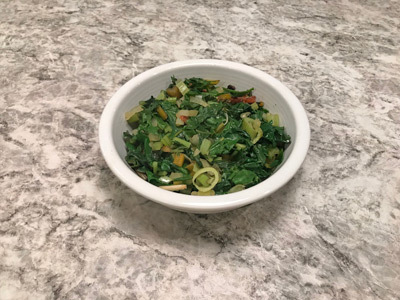 Add Swiss chard greens, cut into 1/2 inch ribbons, to the skillet with about 1/4 cup of water. Cook until greens have softened, about 5 minutes. Assemble dish by adding back bacon, chopped into 1/2 inch pieces, and about 1/4 - 1/2 cup parmesan cheese to taste. Serve immediately. 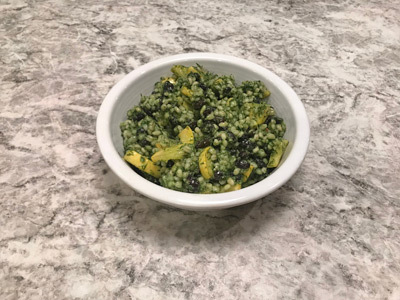 To make lettuce basil pesto combine 2-3 cups of packed loose leaf lettuce (about 1 bunch), 1 cup of basil leaves, 1/4 cup pine nuts, 1/2 cup olive oil, 1 tsp salt, 2 tsp balsamic vinegar, 1/2 tsp dijon mustard, and 1/2 tsp honey. Blend until well mixed. 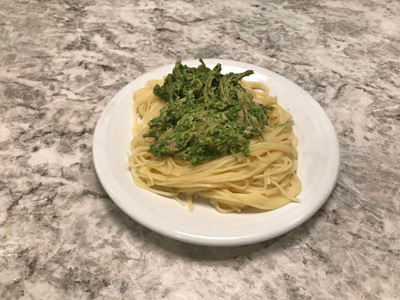 Combine 2 cups of cooked and shredded chicken breast with lettuce basil pesto and serve over angel hair pasta (1/2 lb dry).